Parents at this British secondary school received a letter telling them to stop challenging teachers. The principal of a private secondary school in England has sent a letter to parents, saying that they are too quick to rush to their children’s defence when they are disciplined by teachers. Bruce Grindlay said the number of parents challenging teachers for telling off their children had risen dramatically and that the letter was an attempt to encourage parents to place their trust in his staff. 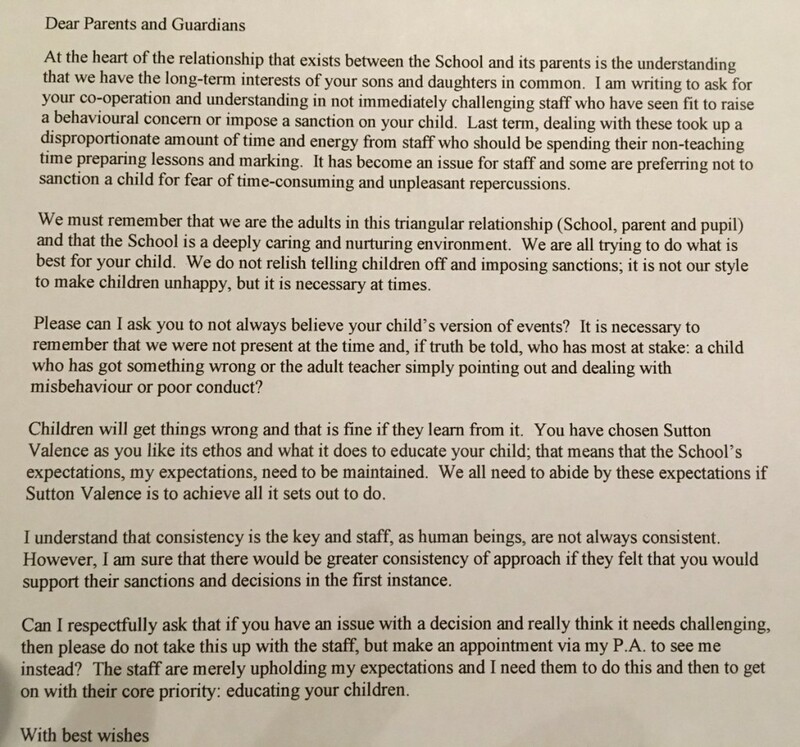 In his letter, Mr Grindlay asked parents to be objective and think twice before challenging a teacher’s decision to get their child in trouble. “We must remember that we are adults in this triangular relationship – school, parent and pupil – and that the school is a deeply caring and nurturing environment. We are all trying to do what is best for your child – we do not relish telling children off and imposing sanctions – it is not our style to make children unhappy but it is necessary at times.” He said that the recent spike in parent complaints had prevented teachers from being able to effectively implement rules and expectations for fear of repercussions. “In society today, there is a culture of parents wanting to be friends with their children, without challenging them,” Mr Grindlay said. Most parents at the school responded positively to the letter, saying that it was a courageous move on the part of Mr Grindlay to take a stand against the constant criticism teachers face. “Great letter. Great school. Great leadership.” wrote Toby, a parent of two children attending the school, sharing an image of the letter with his tweet. Toby acknowledged that while some in positions of authority may abuse their power, it shouldn’t prevent the majority of teachers from doing their job. “Schools, workplaces and society only work if people adhere to a few simple, well reasoned rules,” he said. We have to say that we think Mr Grindlay may have a point – reasonable consequences for bad behaviour, implemented fairly, are a hugely important part of learning to be a responsible, kind and well-adjusted adult. And isn’t that all any parent can ever hope their child to be? Have you ever had an issue with the way your child has been disciplined at school? Tell us in the comments! 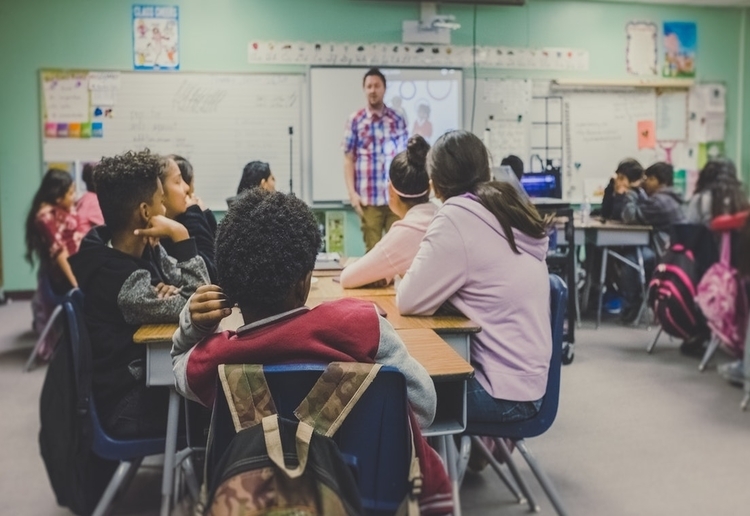 Teachers and schools are in a hard position – if parents don’t discipline their kids they come to school and disrupt learning for themselves and others! I tend to think this is a very proactive approach to what must be a very frustrating situation for teachers who simply want to teach. Unfortunately parents aren’t at the school to see what goes on on a daily basis, so in a sense we have to put some faith in our teachers, unless of course their is strong evidence that our children are being unfairly punished or victimised. Some schools will send a letter to the parents (in the mail) if the teacher has an ongoing problem with a child. I have seen one that a parent received. It was respectful and gave brief details. The parents are asked to sign a slip on the bottom of it to acknowledge receipt of it and write on it what action they have taken. e.g. talked the child about it, explaining why it is wrong and is not to be repeated. They never give it to the pupil to take home ( the parents probably wouldn’t see it). Sometimes the parents are asked to make an appointment to discuss it or parents can request a meeting if they want to. No, I never experienced an issue with the way the school disciplined my children. We do put alot of trust into our children’s teachers, I had slight problem with my daughters teacher un year 1, where she wasnt happy with my daughters writing so made her rewrite her whole book. It looks like a very good idea to ask the parents to see the principal if they have a concern. It must be tiring and frustrating for the teachers to deal with all the parents constantly. I’ve never had a problem with a teacher (so far at least). I trust their decisions. They’ve never given me a chance to think differently. But if something ever happened, I would talk to my daughter asking her to be as honest with me as she has always been, and then I’ll see if it’s necessary to talk to the teachers or not. Agreed, but then when does it stop for the principal! ?